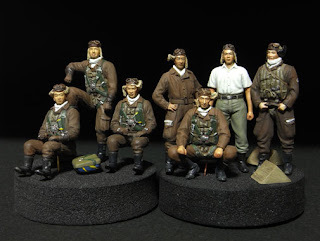 Modelkasten are releasing a special set of 1/48th scale IJN aircrew figures modelled on actual pilots. This superb looking set is available in Japan as a limited edition but I believe - and hope - it will eventually be more widely available elsewhere. One of the figures is included with the May 2009 Scale Aviation magazine. 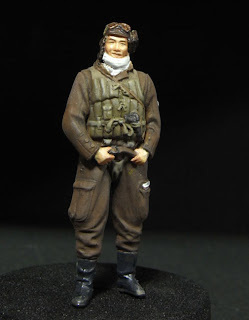 Click on the Modelkasten link to see more detailed views of these excellent figures. I hope that eventually we might see some Army figures from this very talented sculptor - the pages of Scale Aviation Vol.67 suggest that this might just be the case. Following their generic set, which I thought somewhat wasted its potential by including a schoolgirl figure (!) this is a very welcome direction. I hope we see more sets exploring the potential and diversity of aircrew figures and representing other nations too. There is a dearth of imaginatively sculpted high quality figures to enhance aircraft models in all the scales. Seeing the IJAAF figures in the magazine (not to mention the incredible Ki-100 with cobalt blue stripes)gives me hope we will see many more figures...and maybe even ground equipment and crew. hello would you have larger scale figures such as 1/24 or 1/32 scale ??? Not as far as I know. They were scaled down to 1/72 but I've not seen 1/24 or 1/32 versions. 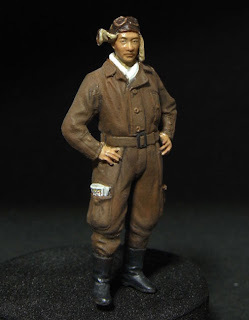 However Zoukei-Mura did 1/32 IJN pilots and groundcrew sets - not sure of current availability, Volks do a 1/32 IJN Shinden pilot and there is an IJN pilot in Master Box's 1/32 Fighter Pilot set.